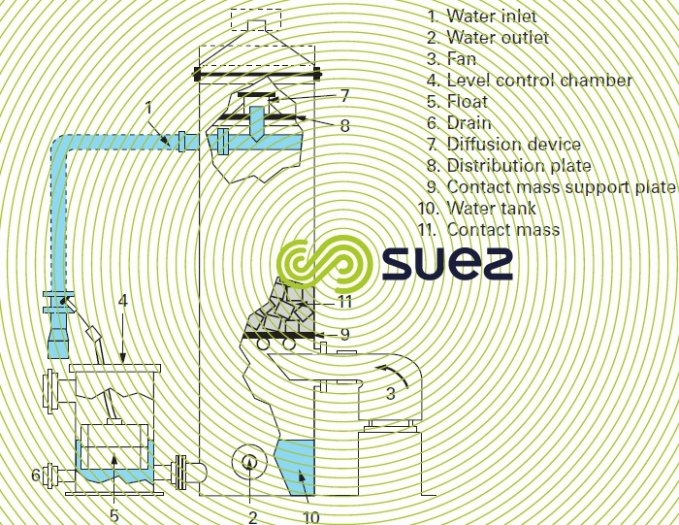 In these appliances (figure 1), water is either sprayed or dispersed and evenly distributed over plastic or stainless steel packing that is either supplied as an orderly sequence or in bulk (made up of rings, saddles, …) A blower feeds air over the perforated base plate that supports the packing. Air and water circulate against each other. The degasified water is collected in a tank positioned under the contact column. As mentioned in gas-liquid exchange, the residual concentration of CO2 in the liquid phase will depend on temperature, on water velocity, on packing type and depth and on air flow. packing depth: 1.5 to 2.5 m.
A residual concentration of around 1°f , i.e.8,8 mg/l can be obtained with a properly designed CO2 eliminator. It should be noted that this residual CO2 content at the stripper outlet may be less than the equilibrium value and therefore encourages the formation of CaCO3 scale and consequently the collapse of the packing. 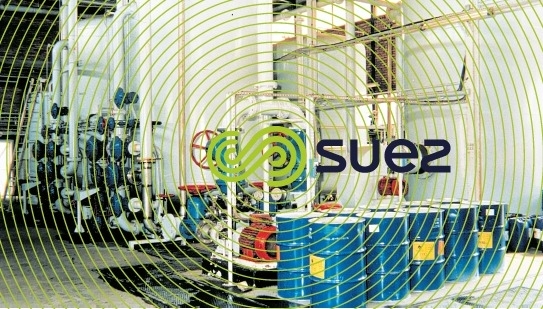 Standard industrial facilities treat water with high CO2 content. Other installations has been made for borehole water or for nanofiltrated water which contain less CO2 content and thereby allow for higher water speeds (up to 150m/h).